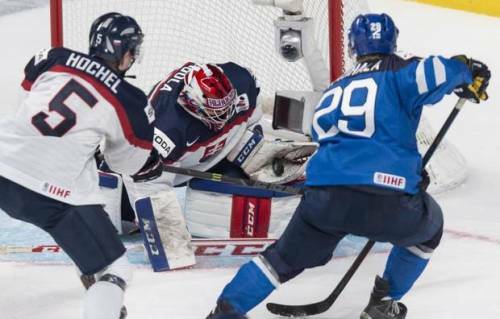 A power-play goal, a lucky bounce and some stellar goaltending was all it took for Slovakia to beat defending gold medalists Finland. On the back of Slovakian goalie Denis Godla, who put on a performance reminiscent of playoff-stealing fellow countryman Jaroslav Halak, Team Slovakia powered through and managed to come from behind in an impressive defensive display. It looked to be on pace for the second consecutive blowout loss from Team Slovakia after they surrendered the first and only goal against the Finns 7:01 into the first period; but the Finnish lack of discipline allowed Slovakia to gather their composure and avoid a second consecutive defeat. Two minutes later, on an Artturi Lehkonen tripping penalty, the Slovaks drew even on an Erik Cernak deflection from a clear point shot from Martin Reway, which was sure to impress his NHL parent club’s faithful (Reway was drafted by the Montreal Canadiens 116th overall in 2013). Throughout the game, the Slovaks made the most out of their opportunities, getting badly outshot 12-38. Capitalizing on a slight error of judgment from Finnish goalie Juuse Saros, Slovakian defenseman Matus Holenda saw his point shot deflected into the net by Saros’s glove, as he mistook the puck’s placement, thinking it lower than what it actually was. The mistake was a costly one, as it would be the decisive goal, despite the onslaught that would carry forward in the second period on behalf of the Finns. In the end, Coach Ernest Bokros’s faith in goalie Denis Godla paid off, as he was pulled after allowing 5 goals against Canada, showing his mental resilience and his ability to steal games. Did I mention Godla was draft eligible last year and went undrafted? Just checking.